When a blog post has been written and published, the job is only really half done. In order to get your blog read, you are going to have to promote your content. Otherwise, who is going to read it? Tumblr sees 120,000 new blogs a day created. That’s blogs, not blog posts. Promoting your content and getting it read is hard work. Today we’re going to be talking about how to make it easier. 1. Is your post answering a question on Quora? 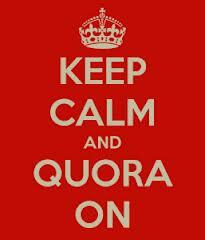 Answering questions on Quora is a great way to establish yourself in an area, and promote your content. The key to great Quora answers, according to prominent design blogger and Quora user Sacha Greif, is making your answer informative, and self-contained. Q: What is the best way to streamline widgets? A: Our app WidgetStreamliner is the best way to streamline widgets! A: There are many ways to streamline widgets. For example, you could […] or […], or even […]. And by the way, our app WidgetStreamliner will help you automate a lot of these tasks. If your post is interesting enough for people to read, it will be interesting enough to provoke a response on Quora, right? In that case, why not anonymously ask your question to a group of people on Quora? If people respond, go back in and answer the question yourself using your personal account. Claremont’s Nancy Platts is the master at this. When Nancy writes her “Campaign of the Month” blog posts, she asks members of the E-Campaigning forum to send in suggestions for their favourite campaign, and asks for submissions. She then goes back to the forum with the finished post. In the past few months, we’ve seen a steady stream of E-Campaigning forum members sign up for Claremail. Sometimes the best way to promote great online content is offline. Ben will often follow up his blog posts with a phone call to people who he knows will be reading Claremail. The key here is authenticity. Ben doesn’t call contacts merely to flog his blog, but it’s always given at least a passing mention. As a result, Ben’s posts are amongst the best performing on the site. Google+ is slowly taking over the world. I’m not in love with the ‘social network’ side of Google+ (yet), but I’m finding myself coming back to its components (such as Hangouts, and the new Hangouts app) more and more. Do you use GMail? You’ll get notifications when anyone in your circles shares new content – and their posts appear in your sidebar. Through Google+, I’m reading people’s blogs who I never thought I would read before. Google+ is here to stay. Make it work for you. Hands up if your email signature hasn’t changed in the last six months? No? Guess what, Google is onto you. Google will show your email signature to someone exactly once before hiding it from them for all eternity. That link to your blog might not be working as hard for you as you think it might. Instead, why not change that part of your signature to “Most Recent Thoughts” and change the title every time you write a post? (Hopefully every week!). Links to actual blog titles will always be more compelling. This is social media 101. Your social profiles probably occupy a sizeable digital footprint – tweet, Facebook update and @reply your post to people who you think might be interested. Consistently post quality content, and you’ll be amazed at the response you get – and the authority you build. What’s worked for you? What strategies are you using to promote your content? Are you using any of these already? Maybe you’re using a new platform like Medium or Quora Blogs. How is that working out for you? Nice post with some great practical tips. However, I'm really not comfortable with the ethics around your suggestion of anonymously posting a question and answering it yourself. This seems misleading and akin to astroturfing. Why not simply ask a question in a more transparent way - and then join in with the responses as part of an authentic debate/conversation around the answer. I'd be disappointed if PRs still felt the need to use outdated practices like this to generate online traffic.